As you know, I'm a big Nancy Mommy's supporter. I have tried few of her recipes, here are two recipes from her but I have made little changed on it. 1) 红烧狮子头 - my meat ball size was slightly smaller, and I added white carrot and fish maw. 2) 酸梅酱鸡块- chicken marinate as per Nancy's recipe, but instead of plum asam sauce, I changed it to butter style - butter, garlic, curry leaves, chili padi and evaporated milk. 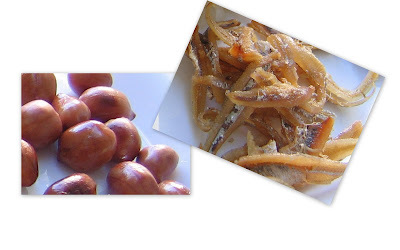 - I did follow exactly to her original recipe, very delicious, you must try it. I did not bring back any souvenir from my recent Swiss trip, but instead I brought back some nice photos and nice memories. I choose 3 of my favorite shot, develop and frame it up, and it became the wall decoration items in my living room. Knowing this French deliciously rich bread (Brioche) from a food magazine, I immediately give a try. Some of the measurement mentioned in that magazine was inaccurate, that's why I do not want to mention this magazine name. I have no choice, use my own judgement, add here and there, surprisingly the result was really great. You must try this recipe, the bread tasted like bread and also tasted little like cake(when hot) , can you imagine it !!! Outside is crispy, inside is soft, buttery, very difficult to describe, you must bake yourself and taste it. So far, I have not seen this kind of bread selling in bakery shop here. I don't have muffin mould, so I use the paper cup to bake , thus it became cup bread, hahaha!!! 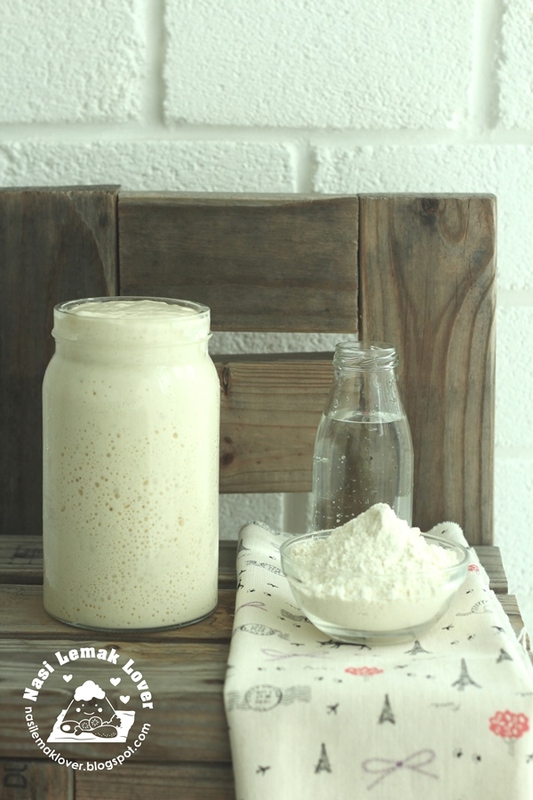 Yeast base - mix 1 tbsp lukewarm water with 5g of instant dried yeast, set aside until frothy. 2) Add the softened butter and knead for about 5 minutes. Rest the dough for 1 hour. 3) Knead the dough again and cover with cling film and refrigerate for 2 hours. 4) Dust the worktop with flour, shape the dough to your preference shape. 5) Set aside again to proof until doubled in size. 6) Brush the top with the beaten eggs and bake in preheated oven at 180c for 20minutes. ** The bread turned quite dry in the next day, so advise you to finish at the same day. Recently, the weather here is very very hot, for prevention, I started preparing some cooling Chinese herb drinks e.g barlic, sugarcane , Chrysanthemum Flower tea & etc for the family members. This is the Chrysanthemum Flower tea, the Chinese herb shop owner highly recommended this good quality Chrysanthemum Flower to me. p/s Colin, these photos taken followed by the tips that advised by you, let me know your comment. Usually when my mother, "Chi Moi" friend and relatives visit me, they like to chit chat in my kitchen as my kitchen is open concept (dry and wet together), an island at the middle of the kitchen. In order to let visitors have more space to sit , so I get my husband to do a simple bench to place in the kitchen. Surprisingly his came out with a good design, this bench can be sit and can be store stuffs. This is my simple version of Lei Cha. Thanks to Bakeling sent me an email for the Lei Cha recipe. But I did not follow exactly to that recipe, because the ingredients are too many types. I just use whatever that I easily get it. Homemade Lei Cha recipe (can make for 3 small containers, store in the freezer for future use) , just blend all the ingrediants and mix well. Just like to share this nice roses which my husband bought this morning. After I took the photos, I accidentally broken the glass vase, so this was an expensive photo that I ever took, hehehe.. 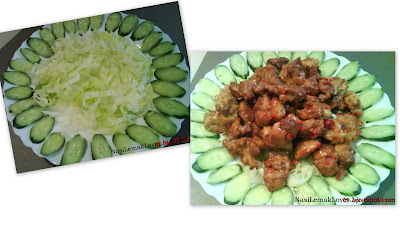 Sometime, after having too much of meat, I like to prepare Hakka Lei Cha, because it is very healthy and delicious. Just put all the dishes and everything into a big bowl of rice, and add the Lei Cha, simple and yummy. - Bitter vegetable ( not sure the actual name, Hokkian people called as "Ko Cai"), stir fry with dried prawn and garlic. - This is ready made Lei Cha which my sister bought for me, very easy to prepare, just add hot water and served. I'm learning to prepare Lei Cha, so far, I knew few ingredients to be added, e.g mint leaves, sesame, peanut & etc. Once I figure out how to prepare it, I will share the recipe. p/s You may change the vegetables to your preferences e.g cabbage, leek & etc. Researched done on few blogger on how to making bread and with my little experience on making pizza bread, this was my first attempt in making bread, the result turn out very good, the bun & bread was soft, fluffy and milky. As I do not have a heavy duty mixer and bread maker, I made the bread by hand. It is not difficult as you thought. 2) Mix into dough, knead the dough until elastic, smooth and non-sticky, about 10mins. 5) Shape and add fillings as desired, and arrange in a greased pan. 6) Leave it to prove again for another 15mins. The buns still soft even kept until the next day, but advise to finish it all on the next day since the bread did not add in any chemical ingrediants e.g bread improver, softener & etc..
Do try out this simple, healthy and delicious buns and bread. To be a Truly Nasi Lemak Lover, I finally created this special edition of nasi lemak. a. Place washed rice, salt and knotted pandan leaves in an electric rice cooker. b. Pour coconut milk over the rice and leave to soak for 30mins. d. Once rice is cooked, leave it warm in the rice cooker. a. Heat the oil in wok, saute blended onion paste until fragrant. b. Add in blended dried chilli paste and continue tumis (cook) for 30mins under low heat. c. Add water and sugar and continue tumis (cook) for another 20mins under low heat. d. Lastly add in sliced big onion. ** Must put a lot of blended onion, oil and sugar. If you prefer stronger taste of sambal, you may add in shrimp paste (belacan) . 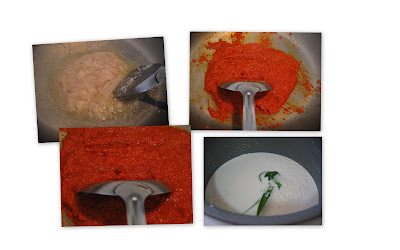 ** You may add in ikan bilis, prawn, sotong & etc to the basic sambal paste. Braised this salted vegetables with the leftover roasted pork, add a canned of braised peanuts before dish out. This is best to eat with a bowl of porridge. Promised to 米亚 to teach her homemade pizza bread base, my sister-in-law share this recipe to me earlier, but I have made some changes to reflect the actual practise. These pizza actually was prepared soon I returned home from Switzerland trip, I bought a bottle of mixed herbs with a good price. 1) Base A : Mix yeast and warm water and leave aside till frothy (about 30mins). Then add fresh milk, sugar and salt and mix well. 2) Sift flour into a mixing bowl, add butter, herbs and add base A and knead till smooth. Leave to prove till double in bulk (normally about 1 hour). Punch down and leave to prove for another 15mins. Roll out, pull gently into 3mm thick round sheet (you can adjust thickness to your preference). Place onto a greased baking tray. 3) Use fork to put hole on the bread base, brush tomato taste onto the base, sprinkle the topping on top (grated cheese to put last). 4) Bake in a pre-heated oven at 180C for 30 minutes or till golden brown. Remove and serve hot. Note: Topping can be adjusted according to taste e.g cooked chicken meat, cooked minced beef, ham, sardine or tuna fish and etc. Visited this “Eighth Wonder of the World” Firefly Kuala Selangor on last Mar school holiday, this place is very near to my kampung "Sasaran" (hometown), just 15mins by car. If drive from KL, it will takes about 90mins. There are two locations where visitors can take boat ride, one is at Kampung Kuantan and another one is at Kampung Bukit Belimbing (5min from Pasir Penambang) . We went to Kampung Bukit Belimbing and via Firefly Park Resort entrance. -Entrance via Firefly Park Resort. Usually the place is quite packed during the weekends hence try to go during weekdays.The best time to visit the park is after nightfall at approximately 7:30pm to 7:45pm. -You may choose to stay one night here at the chalet in this resort. But for local girl like me, we will not choose to stay here, just an educational night trip with my children to this place is good enough. **Sorry, I'm not able to show you the firefly scene, as we are not allowed to use camera with flash to take pictures during the cruise as they said this will disturb the habitat of the fireflies. Anyway, I asked their permission to take few photos (w/o flash), unfortunately I can't get anything, the photo just all black. p/s After the trip, you may take your dinner at the nearby "Pasir Penambang" and you will find many sea food restaurants there.